The popular Firefox security and privacy extension NoScript has been released for the Google Chrome web browser. NoScript has the sixth largest user count of all Firefox extensions at the time of writing. Note: The developer of NoScript, Giorgio Maone, labels the Chrome port as beta currently. The Chrome extension page does not list it as such, though. A stable release is planed for the end of June 2019. NoScript was a Firefox-exclusive extension for a very long time and one of the main reasons for security-conscious users to use Firefox instead of Chrome or other browsers. We published several guides in the past years to highlight NoScript functionality and promote the extension. A NoScript guide covering all major features in 2014, a beginner’s guide in 2016, and a guide for the WebExtensions version of NoScript. Third-parties made attempts to bring NoScript functionality to Chrome, the 2010 extension release NotScript tried that for instance. Mozilla paved the way for a cross-platform NoScript extension when it turned off the classic extension system in Firefox 57. 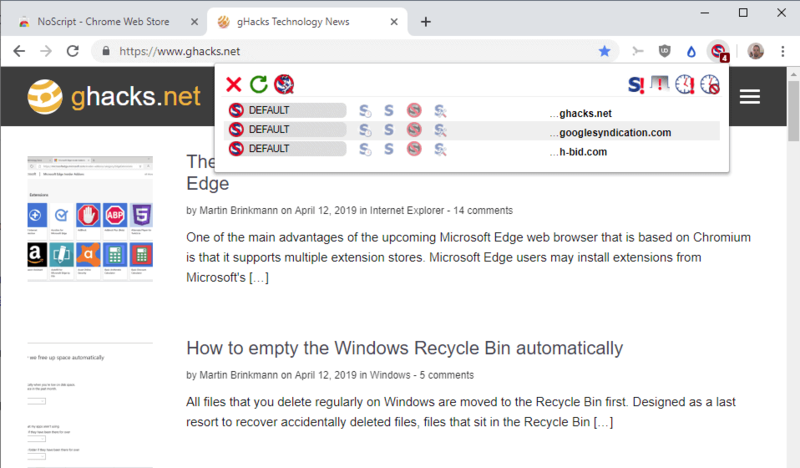 The organization selected WebExtensions as the new system for Firefox which, among other things, ensured compatibility (to a degree) with Chrome extensions. Up until now, we have seen ports of Chrome extensions to Firefox for the most part. NoScript, which was launched in 2005 (just like this blog), has been turned into a cross-platform extension fourteen years after its initial release. Today’s release marks a milestone for the extension; the Firefox and Chrome versions of NoScript share a codebase and it is possible that support for other browsers may be added in the future. NoScript for Chrome works just like the Firefox WebExtension version for the most part. The extension adds an icon to the Chrome toolbar that indicates blocked content. A click displays connections and whether they are allowed or blocked. You can allow connections temporarily or permanently, and make other configuration changes in the options. There you find a list of allowed connections that you may want to go through to remove those that you don’t want to allow. 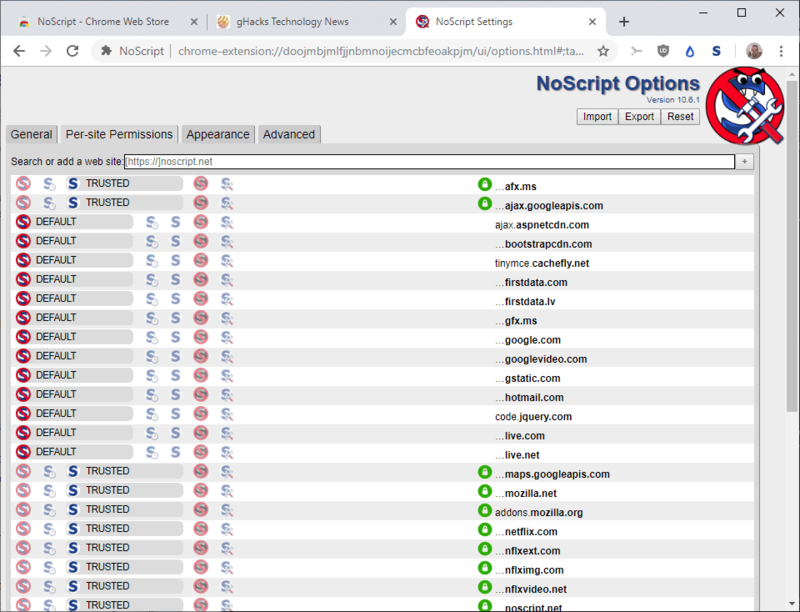 Our tip to check the NoScript whitelist section on first install still holds, as you may not want to allow connections to Google, Microsoft, Yahoo, and other domains owned by these companies by default. One of the main reasons for using NoScript, its XSS filter, is not available in the Chrome version right now. The main reason for that is that Chrome’s extensions engine does not support certain features that Mozilla added to Firefox when it started to work on the WebExtensions switch. 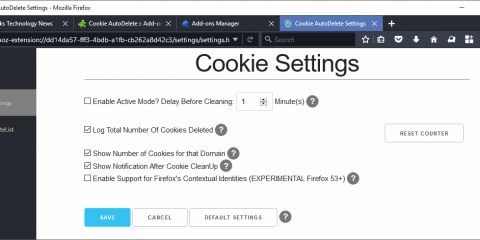 Support for WebExtensions in Firefox enabled compatibility with lots of Chrome extensions and options to port extensions from the browser to Firefox easily. Firefox extension ports to Chrome are rarer, but they do happen as well. NoScript becoming available for Chrome is major news, even though functionality is limited in comparison to Firefox at this point in time. 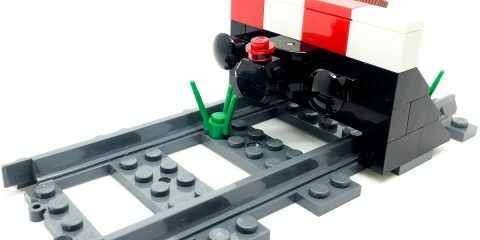 Now You: Which security extensions do you use, and why? Ghacks needs you. You can find out how to support us here or support the site directly by becoming a Patreon. Thank you for being a Ghacks reader. The post Firefox extension NoScript is now available for Chrome appeared first on gHacks Technology News.